Chad Anderson has joined the team at Merchants Bank as Vice President and Business Banker, according to Randy Domeyer, Senior Vice President and Business Banking Department Manager. Before joining Merchants Bank, Anderson had been employed at Winona National Bank the past 12 years as a business banker. He has experience in all areas of business lending, including commercial, residential, real estate, equipment loans and SBA (Small Business Administration) lending. Anderson is a native of the area and is active in community organizations, including currently serving on the boards of the Winona ORC and the Winona Area Chamber of Commerce. 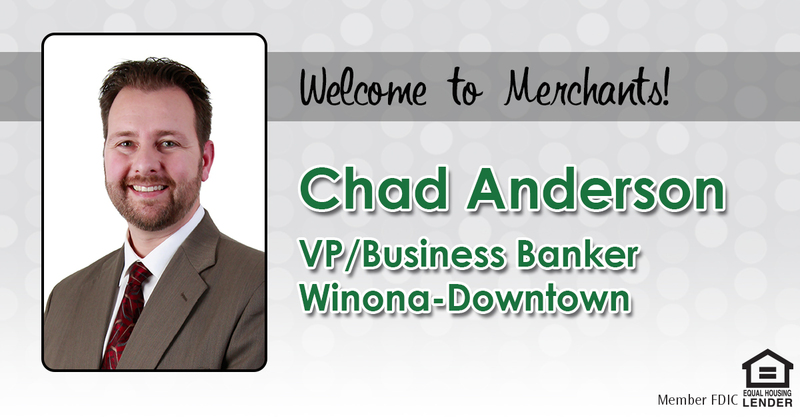 Contact Chad for your business banking needs today: 507-457-1196 or cjanderson@merchantsbank.com. If you have questions regarding the routing number change, please contact a Customer Service Representative at your local Merchants Bank. Saute spinach, oil and vinegar in pan over low heat. This should only take a few minutes – do not overcook! In mixing bowl, combine cream cheese and artichoke pieces; add approximately 2 tablespoons of juice from can of artichokes. Add remaining ingredients. Add remaining ingredients. Stir well. Serve with baguette bread, crackers, bagels or breadsticks. You can also add imitation crab meat. This dip can be served cold or warm. Cook’s note: To serve warm: Top with more cheese and bake in pan at 350 degrees for 20 minutes. Add parsley to garnish.